The best part of this app is, that you can stay as an anonymous while you are “studying” the feelings of the person, whom you are crushed on. It is one of the most awkward situations, when you are crushed on somebody and you can`t be sure about his or her feelings. Of course, it would be much easier for you, if you knew exactly your situation and there would not be any risk to make yourself a fool. But it is a part of the “game” and so it has always been, is very typical attitude against this kind of situation. I have good news for you, who is crushed on somebody and is uncertain about own situation. Will you get a positive feedback for your feelings, is the question you would wanted to get an answer. Devista B.V. has released an app called Yentle, which can find this answer to you and support you at this critical moment. The best part of this app is, that you can stay as an anonymous while you are “studying” the feelings of the person, whom you are crushed on. This sounds interesting! How does it work? Frankly said, the process has been designed really simple and direct acting. It bases on the codes. So you can guess, that this app is easy to use! First you have to upload yourself at the Yentle`s app in your iPhone or iTune and then sign up on the app. You will receive the code of your own and then you will be ready for your “studies”! You will have various options to act with your code. 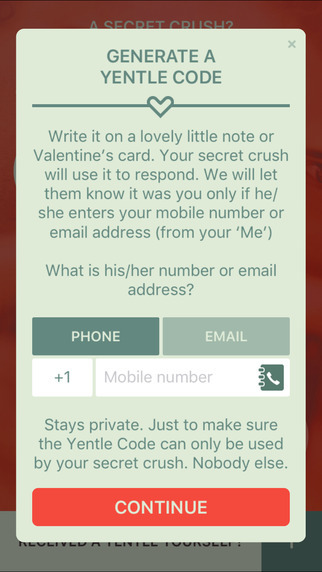 First, you can send a Valentine`s Day card with your code to your crush. 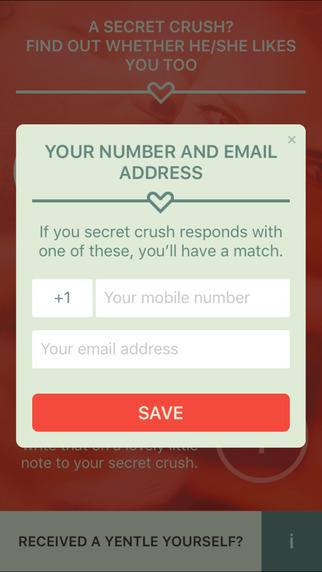 Second, you can send a note with your code to your crush. This was very easy part of the process for you. After this it will turn harder for you. I mean, you have to just wait for what will happen. 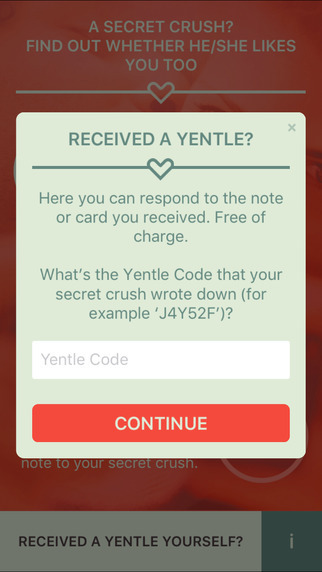 After receiving your code, your crush should sign up with your code on Yentle. And if it will happen, it is a match! Yeah!!! This is the only situation, when your identity will be open on Yentle. After this you can begin chatting with crush and the rest will be the history. But, there will be chance, that your crush will reject your code… What will happen at this situation? Nothing. Your identity will stay anonymous for your crush. Maybe you will be little bit upset. But, the positive side of the case is, that you have got an answer for your question and continue your life forward towards the new chances. Yentle is very easy to use. It has only two options: you can send your code or you can check, if somebody has selected your code by your app. I believe, that anonymous is very important factor for everybody, who will download Yentle on their cellphone or tablet. There is one very important point of view, which distinguishes Yentle from other dating apps. You can take control your love life with the persons you are interested instead swiping endlessly through unfamiliar faces. It is impossible to find something negative about Yentle. I will recommend it!